My focus this Fall has been to create simple, hearty and nourishing meals that I can make in large batches and eat leftovers for at least a couple of meals. I’m noticing a certain pattern emerge when I need to cook this way. There’s a gluten free grain like quinoa, millet or rice that I cook separately. And I sauté whatever vegetables I have in the fridge. A bowl of the grain and sauteed vegetables, usually curried in some way, and a hard boiled egg makes for a very satisfying meal. The awesome thing about cooking this way is that it gets much easier to accommodate food allergies! This dish is gluten free, soy free, dairy free, and FODMAP friendly for those with fructose malabsorption or fructose intolerance. And this is absolutely my favorite way of making carrots! So if you’re getting pampered with spectacular food or just over indulging at holiday parties, here’s a dish that looks stunning, tastes great but is also good for you. I must admit that my problem this holiday season has not been the food so much as the wine! Got any tips for me? Put the quinoa, 2 cups of water and a big pinch of salt in a pot. Bring to a boil and then simmer on low, covered for 15 minutes or till the quinoa is cooked. Heat the oil in a skillet or pan over medium high heat till you see ripples on the surface. If the oil is hot enough, a mustard seed thrown in will sizzle. Sizzle the whole spices for just 15 seconds or till the mustard seeds start to pop. Add the ginger and garam masala and stir for 10 seconds. Immediately mix in the carrot and chard and cook for 2 minutes while stirring occasionally. Add 1/3 glass of water, and cover the skillet. Simmer for another 5-10 minutes or till the carrot is cooked. Form quinoa cakes by pressing some cooked quinoa into a small and flat bowl; ramekins are perfect. Upturn the bowl onto a plate and voila, you have a quinoa cake. Place some of the curried carrot and chard on the quinoa and serve. Or if you are eating by yourself and don’t care about presentation, just mix it all up in a bowl like a quinoa salad. This was one of those dishes I threw together in 10 minutes because I was hungry and had leftover cooked pearl millet. It was an unexpected treat. Famished as I was, I realized I should probably take a couple of pictures before I ate it all up. So here they are along with a recipe. If you’ve never cooked with whole pearl millets before, run to the grocery store, now and get your self some! It is that awesome. We eat millet instead of rice often. I first ate cooked whole pearl millets while visiting my in-laws. My MIL makes a very delicious crust-less pie with whole millets and slices of pears all baked together and served with apple compote. What are millets? Millet is a collective term for tiny seeds from various grasses that are not even related to each other. They are used as grains and are typically highly nutritious, more so than wheat or rice. I use pearl millets as they are easily available in Seattle. There are however many kinds of millets. In South India, finger millets are widely used and I’ve shared a delicious rustic flat bread recipe before. I’m calling this dish Upma though it’s a lot simpler than the real deal South Indian uppitu or upma. I’ve eliminated a lot of the typical upma ingredients such as onion and grated coconut and used millets instead of semolina because of my food issues. You are welcome to add those ingredients back in or follow my recipe as is. It will be delicious either way. 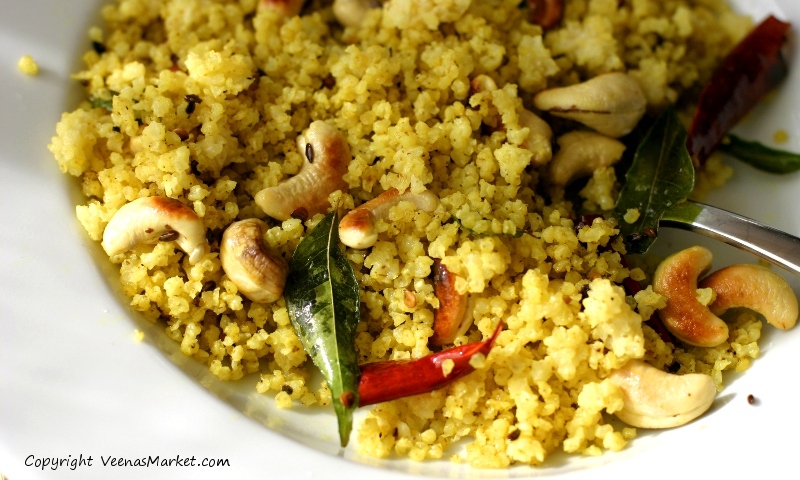 Pearl millets are also a great gluten free substitute for couscous. I would recommend serving this millet upma with a side of plain yogurt and spicy pickle. It’s perfect as a snack, savory breakfast or light lunch. 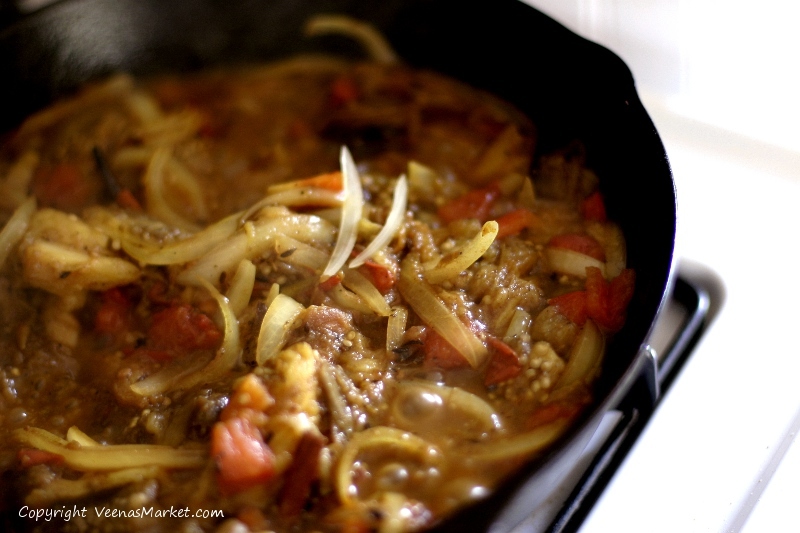 This recipe is vegan and gluten, onion and garlic free. It’s a FODMAP friendly recipe. Heat the oil over medium heat. When you see ripples on the surface of the oil, add a mustard seed. If it sizzles, the oil is hot enough.Sizzle the mustard seeds and curry leaves for ten seconds or till the seeds start popping. Saute the dry red chilis, urud dal and flax seeds for another 10 seconds. Add the turmeric powder and stir in the millets and cashews. Add salt and squeeze fresh lime juice to taste. Serve with a side of yogurt if you can eat dairy. Liked this recipe? Here’s another gluten free version of the Upma recipe. Alright, I’m just gonna say it. How can anyone not like eggplant?!?! 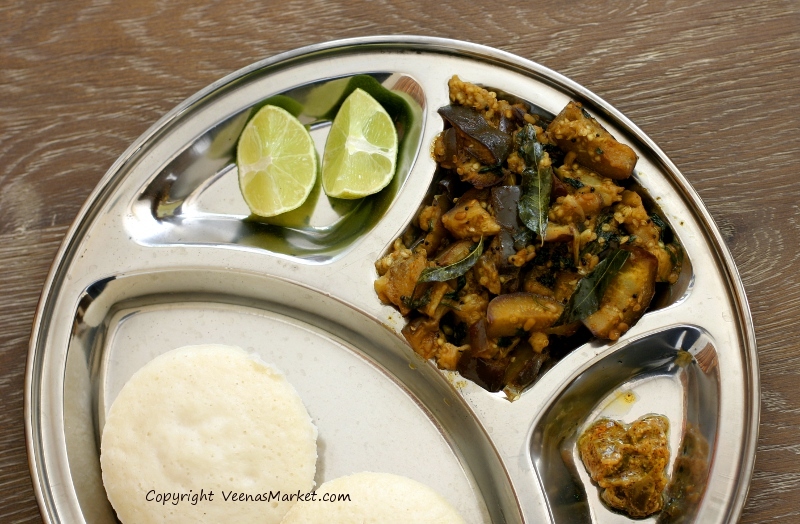 My favorite thing to make with eggplant is my mom’s South Indian style curry with coconut. And one of the dishes I’d love to get right one of these days is Ennegai (with a link to the good folks over at the Monsoon Spice blog). But, sadly, the doc has cut me off onions and coconut for at least the next few months. In this period of mourning, I still need to eat eggplants. So I came up with this simple variation of a curried vegetable dish. What I realized was that no onions actually meant less prep time! And you know what? 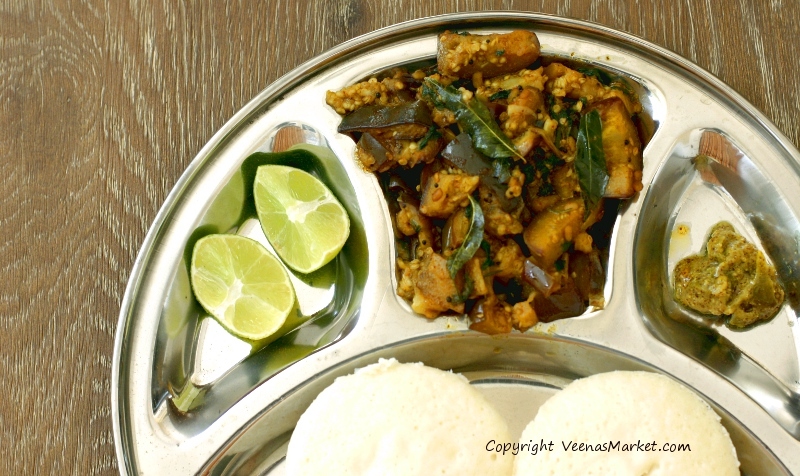 My South Indian heart rejoiced when I had this eggplant dish for lunch with freshly steamed idlis and a side of green chili pickle. It hit the spot. Among other foods, I avoid most ingredients on the FODMAP (a diet the fructose intolerance have to follow) list. If you want to make this dish 100% FODMAP compatible, just eliminate the lentils. Cut the eggplants into roughly 2 inch long and 1/2 inch wide pieces. If you’re doing this ahead of time, place in a pot of water so they don’t brown. Heat the oil in a large wok or pan over medium heat. When you see ripples on the surface of the oil, throw in a mustard seed. If it sizzles, the oil is hot. Sizzle the mustard seeds for 5 seconds or till they start popping. 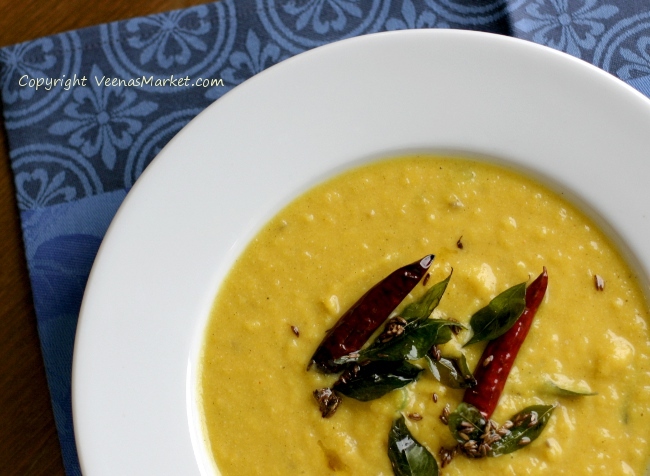 Stir in the curry leaves, chilis and urud dal and let them sizzle for 10 seconds. Be careful, the oil may splatter. 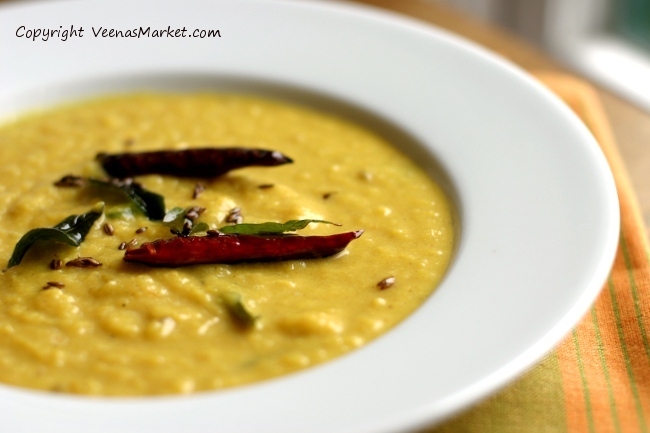 Add the garlic, eggplant, turmeric and sambhar powder and cook for 2 minutes while stirring frequently. If anything starts sticking to the pan, add more oil. Add a cup of water and bring to a boil. Cover and simmer on low for 10 minutes or till the eggplant is soft and cooked. Add salt and lime juice to taste. Do you have food allergies or intolerances? When you first hear about them, you feel really sad to have to cut out something you love to eat. And you wonder how you can do without. Well, I think when you don’t have a choice, you find a way to continue to eat food that tastes great and is nourishing. I’ve mentioned my food allergies before. I now have fructose intolerance to add to that list and can’t eat onions, tomatoes or coconut anymore. If you know anything about Indian food, you know how often these are used. I’m following a FODMAP diet and have also eliminated soy, dairy, gluten, lima beans, and kidney beans. So I’ve been wondering what to eat lately and very importantly, what to blog about! Do you have food allergies? How have you adapted your cooking to your lifestyle? I know completely changing your diet can be a huge challenge. And to make sure that what you eat is tasty and varied. To help those of you with food allergies, I’ve been trying to remember to tag recipes with allergy information where applicable. You can do a search on the left. That brings me to today’s post. Ever had dosa or idlis in a South Indian restaurant? 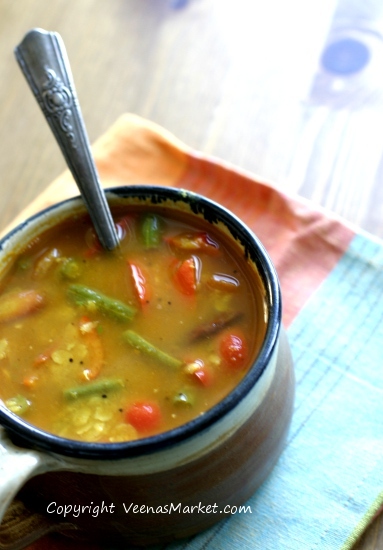 The lentil curry that always comes on the side is called Sambhar. Now I think it’s a delicious dish in it’s own right and can be eaten as a main meal. The best part is that you can easily make 2 or 3 times the recipe and have a big pot to last you all week. It’s one of those rare curries that I don’t get tired of easily. 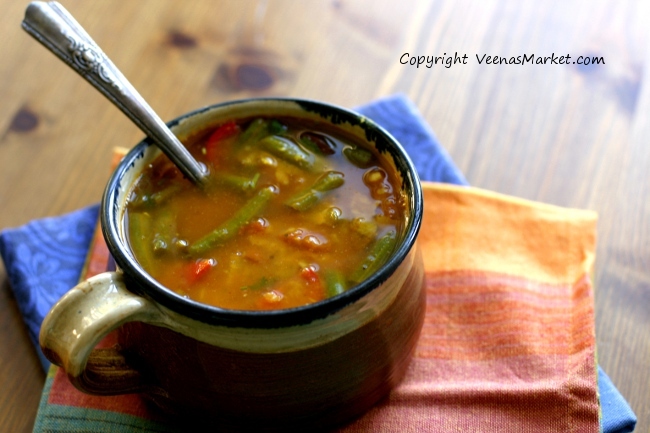 I made this sambhar without onion but still included tomatoes and green beans (also on the FODMAP list). But they were easy enough to pick out. 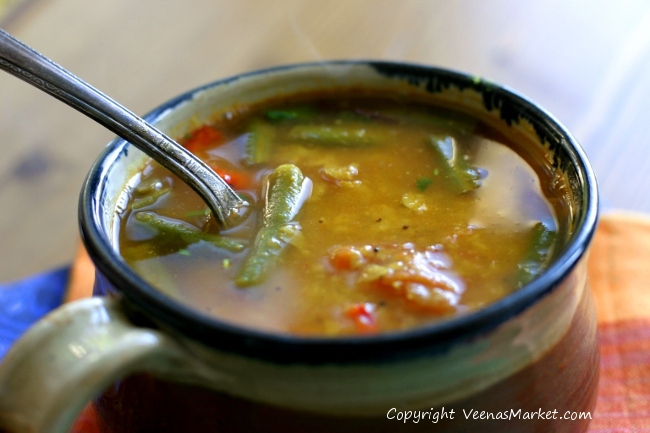 The other thing I love about sambhar is that it is so flexible. You can eat it with rice or other grains like millet. We often cook pearl millet instead of rice at home. You can also eat it by itself as soup. 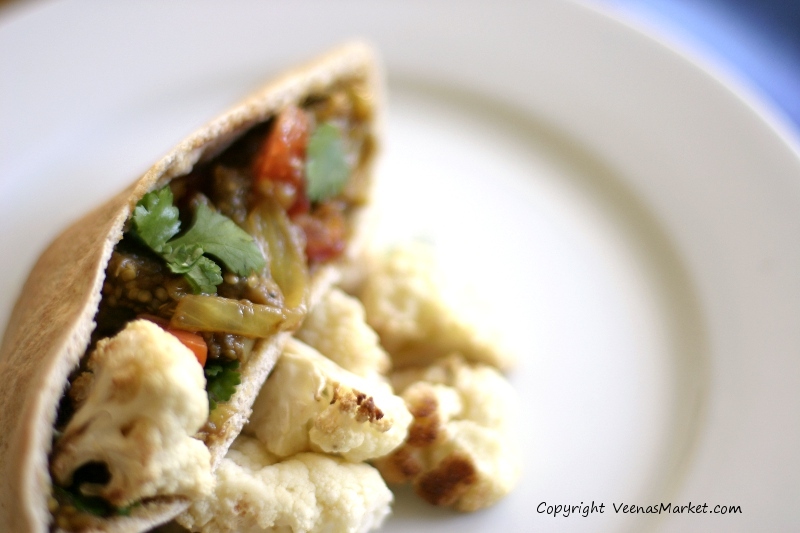 It’s delicious with a spicy Indian pickle on the side or with papadum. Rinse the toor dal thrice. Add 4 cups water and bring to a boil. Cover and simmer for 45 minutes or till the lentils are soft and fully cooked. Mash the lentils with a masher or large spoon. Heat the oil over medium heat in a thick bottomed pot. When you see ripples on the surface of the oil, throw in a mustard seed. If it sizzles, the oil is hot enough. Sizzle the whole spices just for 5-10 seconds before adding the turmeric, sambhar powder, and tamarind extract in water. Stir well. Add the vegetables, salt and enough water to just cover them. Bring to a boil, and simmer covered on low for 10 minutes or till the vegetables are cooked. Add water to just cover the vegetables if needed. 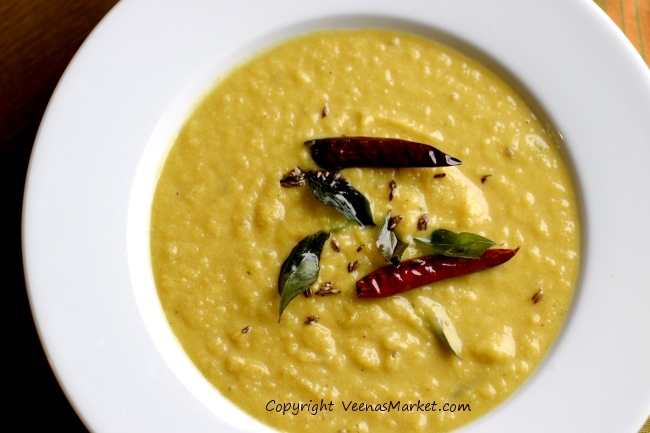 Transfer the vegetables to the pot in which you cooked the toor dal. Mix well. Simmer on low for 15 minutes. 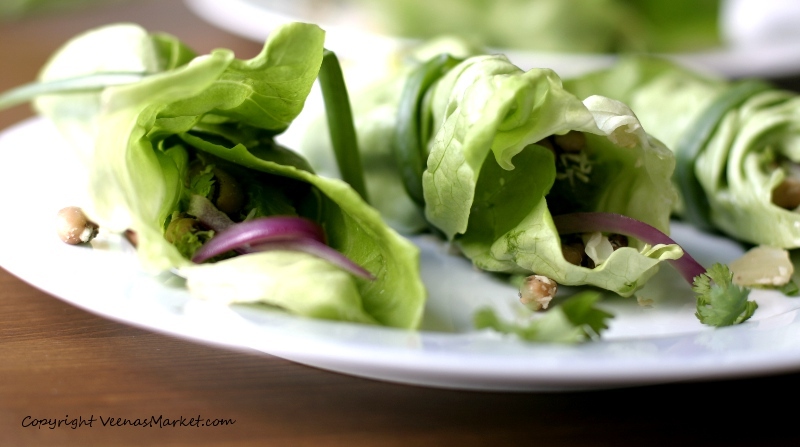 Garnish with cilantro and serve with rice. Dry roast the whole spices and urud dal for 3 minutes on medium low heat. Grind to a fine powder in a spice blender along with the turmeric and asafetida. As summer draws to a close and the days shorten, I’m sometimes at a loss as to what I want to eat. Something cooling or something warming? Something light or comfort food? In a few more weeks, this won’t be a problem. In a few more weeks, I’ll be wanting Daal or a hearty stew almost every day. Till then, I want to enjoy what’s left of the sun before it disappears from Seattle skies for another eight months. Till then, I want something light and comforting. That’s where this brilliant dish comes in. Once you make it, it’s up to you to eat it piping hot, scooped up in warm naan or eat it cold mixed with a swirl of yogurt and a bit of rice. It can be made into a light meal or a substantial one. It’s also great for weekend brunches as you can spread some of that smoky eggplant goodness on crusty slices of baguette and top off with gruyere. In this Punjabi dish, the eggplant is traditionally smoked by placing it whole in a fire or on hot coal. At home, I roast the eggplant in the oven. You could also use the broiler. 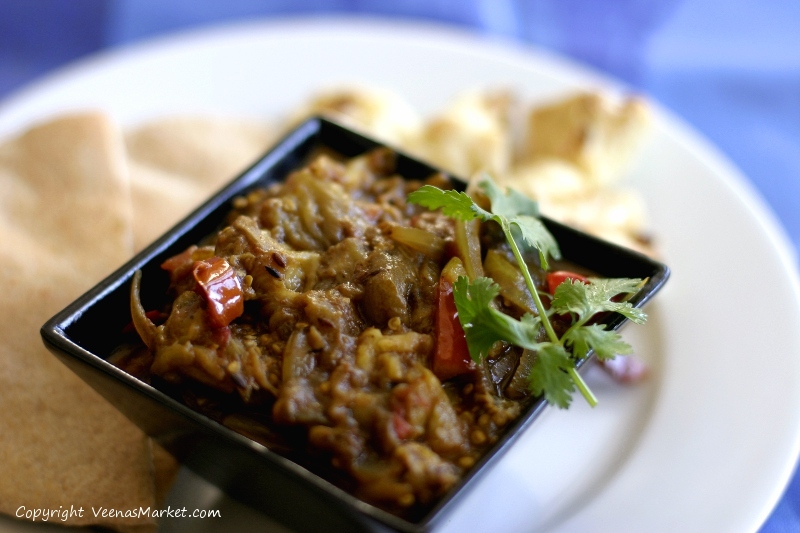 Baingan ka bharta is easily one of my favorite eggplant dishes. I love eggplant. I have an unabashed and unapologetic desire for it’s taste and texture. 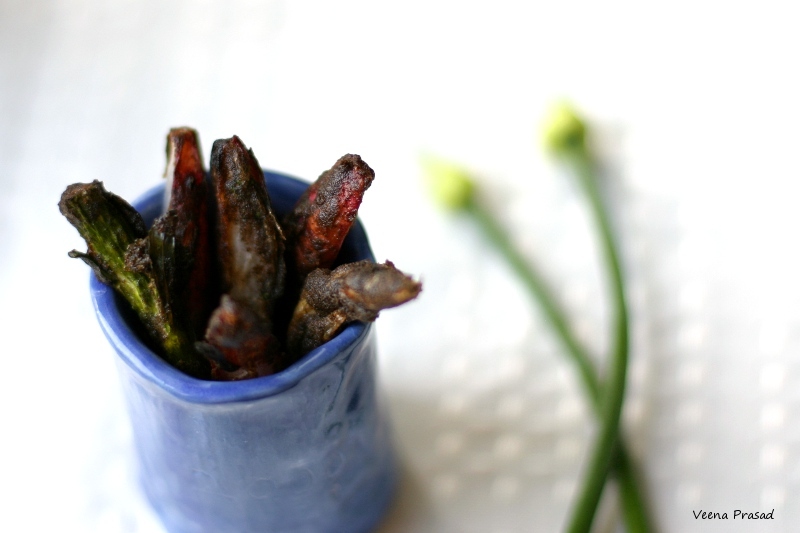 If you’re not sure about this glorious vegetable, be warned, this recipe might not be for you! And finally, here’s the recipe after the pictures. Baingan ka bharta in pita! Served with a side of roasted cauliflower for a delicious vegan meal. Preheat the oven to 450 degrees F. Rinse and dry the whole eggplants. Smear them all over with high heat oil. Place the eggplants on a tray lined with foil or parchment paper. Bake for 40 minutes or till the eggplants are wrinkly and shrivelled up. Don’t worry, they’ll taste all smoky and rich! Broiling them should speed it up but unfortunately we have an old gas oven and the broiler is inconsistent. You can roast the eggplants ahead of time and refrigerate them if you like. Once the eggplants are cool enough to handle, peel off the skin and cut the ends. You can remove the seeds if you dislike the bitterness of eggplants. Chop roughly. 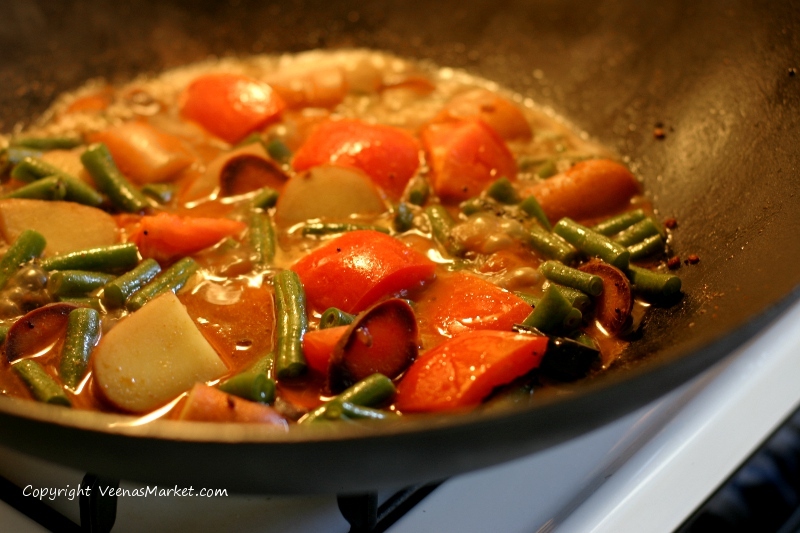 Heat the oil in a large pan or wok over medium heat. The oil is hot enough if a cumin seed thrown in sizzles. Sizzle the cumin seeds for just 10 seconds before adding the onions, garlic and ginger. Cook for 10 minutes, stirring frequently or till the onion is slightly brown. Add all the spices, tomatoes and 1/2 glass of water. Cook for another 10 minutes or till the tomatoes are mushy and the oil has separated. Add the eggplant, cover and simmer on low for 20 minutes. Salt to taste and squeeze half of a fresh lime. Garnish with chopped cilantro and slices of tomato. Serve with naan, pita bread, spread on baguette or with rice. October 24th is National Food Day, a celebration of sustainable, healthy and more affordable food for all. Food Day was started as a movement to get America to eat better, to eat real food. Since eating is such a social act, Food Day is organizing events and parties around the country. So mark your calendars and check the Food Day website to find fun events in your area. Here at Veena’s Market, we love great food! And great food starts with using the best ingredients. And where do you get the best produce? At Farmer’s Markets, of course. Other than growing vegetables yourself, it’s hard to find fresher and tastier produce than directly from the farmer herself. Today, Food Day showcased my recipe for Aloo Gobi. What I made though was a version inspired by what I found at my neighborhood market. The recipe is on the Food Day blog. If you’ve ever been to an Indian restaurant, chances are that you’ve had onion pakoras made with chickpea batter. Perhaps you’ve even made these or had them at a dinner party. These delightful fritters are perfect as an appetizer or snack. Pakoras are kinda ugly to begin with, aren’t they? They’re funny shaped, have a monotonous color and it’s hard to arrange them nicely for an eye-catching presentation. BUT they taste so good! After my last trip to the farmer’s market, I had a few vegetables remaining that really needed to get used soon. So instead of using only onions, I thought it would be fun to experiment with other vegetables. As you know, it’s been a few months since I’ve given up gluten and many other foods due to allergies. With that I’ve been experimenting with many different flours. Since lots of people don’t feel very good after eating chickpeas, I thought of trying a different flour as well. 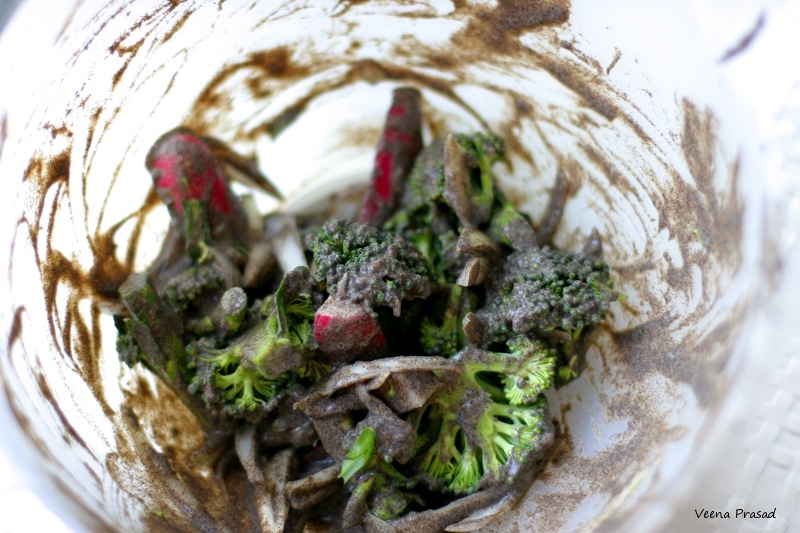 In this recipe, I made pakoras with buckwheat flour and used onions, radishes and broccoli. 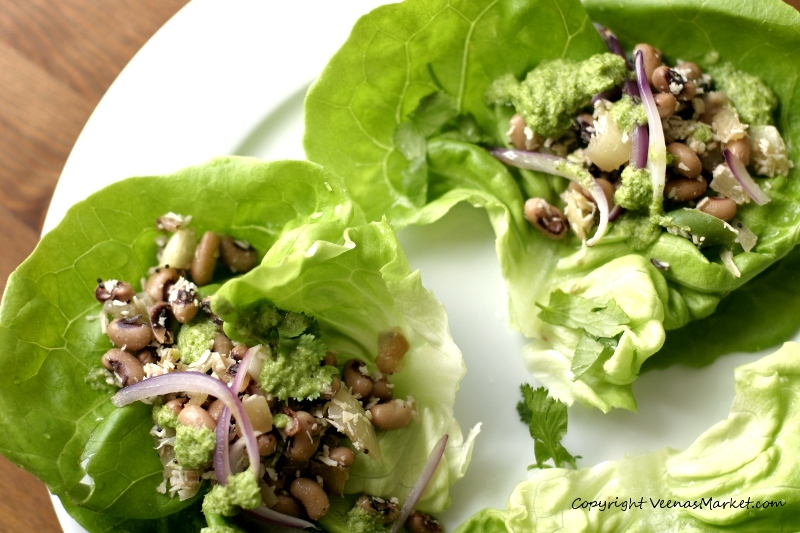 If you’ve never had buckwheat before, it has a more rustic flavor and is dark. It reminds me a lot of ragi or finger millet which is often used in South Indian cooking. Now these pakoras actually looked uglier than regular ones! The dark color of the buckwheat batter is hard to photograph well. But I’ll tell you what, these little fritters were so good that just two of us ate up an entire batch. Yikes! We did pay for this with a long hike the next day. And oh yeah, if you were wondering, the broccoli pakoras were hands down the best. So, enjoy these “ugly” pakoras for a special treat and Happy Friday the 13th! Mix all the batter ingredients together to make a thick batter with consistency thicker than that of pancake batter. Add a ½ inch layer of oil to a small saucepan. I use a small round bottomed pan to reduce the quantity of oil required. Heat over medium heat till the oil just starts smoking and a bit of batter sizzles. While waiting on the oil, prepare a plate with a couple of layers of kitchen paper. Have a slotted spoon ready to remove the fritters. Using a large spoon, gently place spoonfuls of the batter in the hot oil in a single layer. Do not overcrowd. The batter should sizzle immediately. Fry till the buckwheat on the fritters have turned dark. If you are using chickpea flour, fry till golden brown. Place the fritters on the plate you prepared earlier to soak up the excess oil. Repeat the frying process till the batter is over. Allow the fritters to cool down for a couple of minutes. Serve immediately while still warm and crisp. Do You Love Black Eyed Peas Too? I told someone the other day that I had black-eyed peas for dinner. She gave me a funny look. It took me a few seconds to get why. But seriously, I love black-eyed peas. The legume. It was one of those evenings when I didn’t have very much on hand in the crisper. Just an avocado, some butter lettuce, a bit of cilantro and some green chilies. I also wanted something light that wouldn’t take too long to cook. Thankfully, I spied a can of black-eyed peas, just waiting to be opened. And of course, I knew exactly what I was going to make: Indomexican “tacos’ with a South Indian style curried black-eyed peas in corn tortillas or lettuce. This dish is for those who want something fresh and tasty. And quick. Oh and this dish happens to be gluten free, dairy free, soy free and is perfect for Meatless Mondays. Heat the oil in a skillet over medium heat. When you see ripples on the surface of the oil, drop in a mustard seed. If it sizzles, the oil is hot. Sizzle the mustard seeds and curry leaves for just 10 seconds. Be careful as the oil will splash. Saute the onion and chiles until the onion is slightly brown, 5-10 minutes. Add the black-eyed peas and mix well. Turn off heat. Stir in the coconut, cilantro and lime juice. 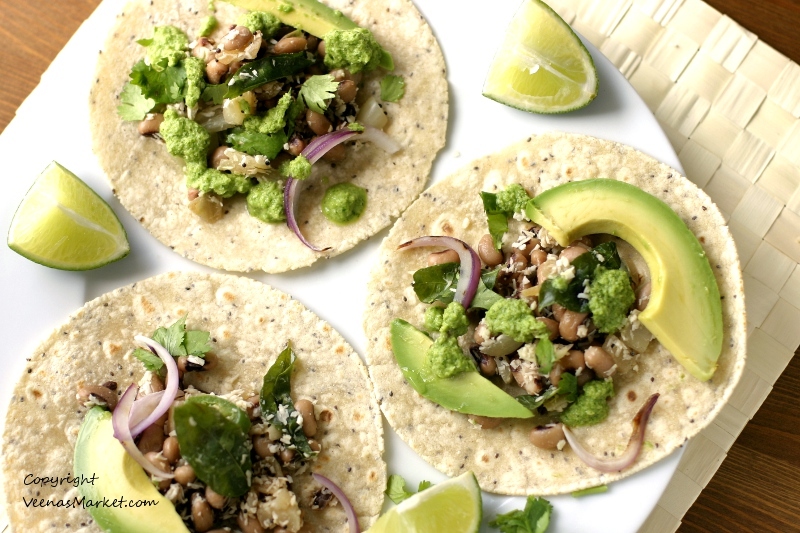 Serve with coconut chutney, avocado slices and tortillas or lettuce. Wrap and enjoy. Note to self: Need more black-eyed peas in my life. It’s been a while since I posted a recipe and I hope to make amends with this guest post. 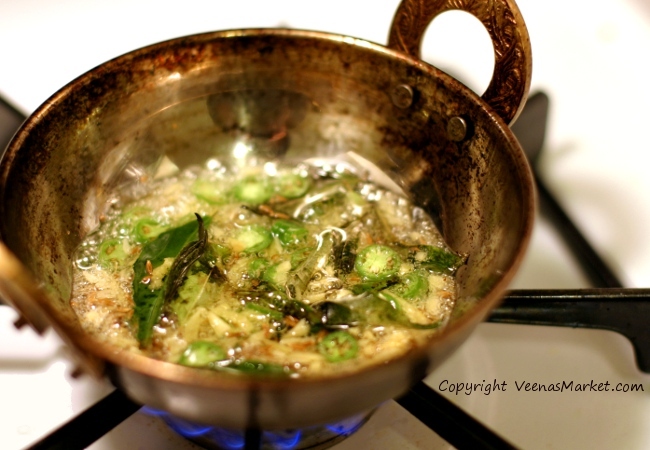 This is a post for Chitra Agrawal of The ABCD’s of Cooking, a kindred spirit in NYC. I met Chitra on Twitter a couple of months ago and love what she’s doing with her blog, videos and events to educate people about authentic Indian cooking techniques and share homestyle food . If you’re in the area, I hope you’ll check out her cooking events and supper club. About that same time I met Chitra, I had also ordered a curry leaf plant start online. 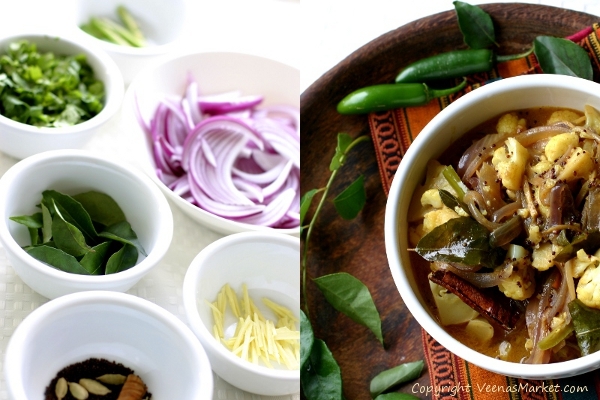 So when Chitra asked if I would contribute a post on her Spice Route segment, I knew what I’d have to write about. Alas, the curry leaf plant never made it to me. The farm had more orders than plant starts and they canceled my order. But, the blog post did happen. So, I’m excited to introduce Chitra here and send you over to her cool site for more on curry leaves and a Cauliflower Curry that marries the earthy flavors of curry leaves beautifully with the sweetness and richness of coconut milk.